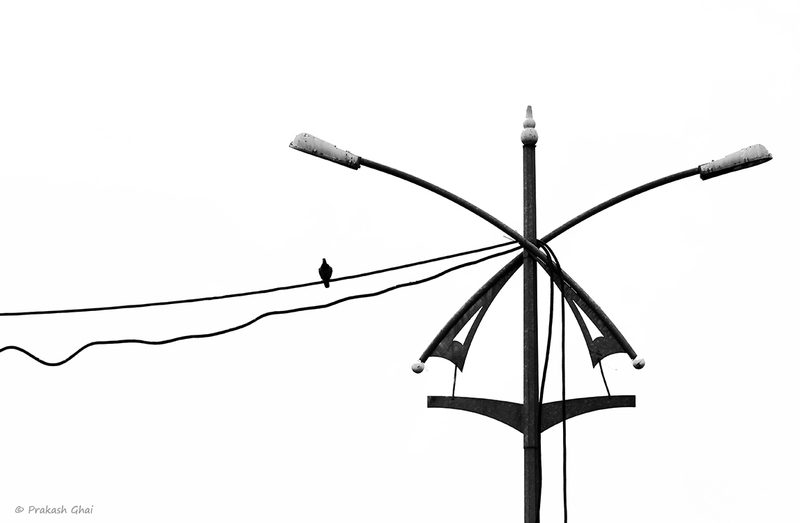 My subject here, is the small little black bird sitting on a wire next to the "X" shaped street light. And hence, this falls under the Minimalism as in Small Objects, as the type of Minimalism in Minimalist Photography. This photo asks for a lot of editing in Photoshop and knowledge of the 0-255 range. Where 0 is pure black and 255 is pure white. Around 128 should be middle grey. You should hover over the black, white and grey areas of your photo to find out exactly how your photo will turn out when you send it for print. What looks black in the monitor screen may not necessarily be black. The message I wanted to communicate with this photo is that one might be just as alone as the little bird sitting on the wire while he/she is working hard to be different from others, but with persistence and hard-work, one day your uniqueness will give you that "X factor", which makes you successful in life. Remember the keyword is "Persistence". For example, I do not have an immediate audience for my Minimal work in my city or country, but I continued with my Minimalism for a couple of years. Now, people have started recognizing my work locally as well. I know its a long way to go but I am all prepared for it.